Delasperma are a large group of succulents from South Africa. Most are low growing and some make excellent ground cover plants. Flower colour varies from the pale pinks through to dark purples of plants such as Delosperma Cooperi which is widely used as a low growing ground cover plant. 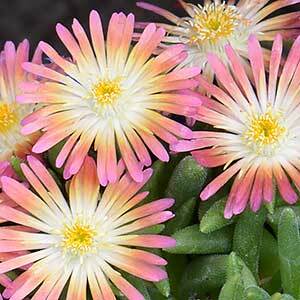 Delosperma Cooperi is also known as the ‘Trailing Ice Plant’, it is drought tolerant, fleshy foliage and very colourful flowers. Use varieties such as Delosperma Cooperi as a ground cover in poor soils. Try growing it in containers, either on its own or fro underplanting taller plants. Try it in a mixed planting of succulents. A well drained soil is essential and these tough little plants will thrive in coastal soils and poor rock ground. Full sun is best although they do cope with a little shade.